Day two of getting ready to head back to school. 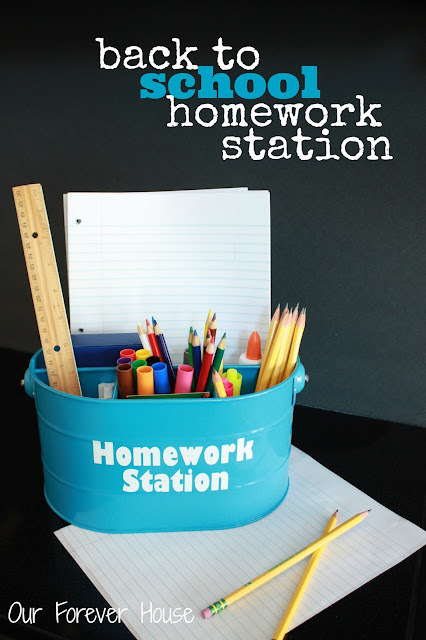 Today I am sharing how I put together a simple homework station with the goal of keeping us organized. Our kids are young enough yet that I still have them sit at the kitchen table after school to do their homework. One of the big frustrations I had from last year is that we could NEVER find a sharp pencil or other supplies needed to complete their work. I had the perfect thing to create this station - a picnic organizer that I picked up at Target a few years ago in their summer section. 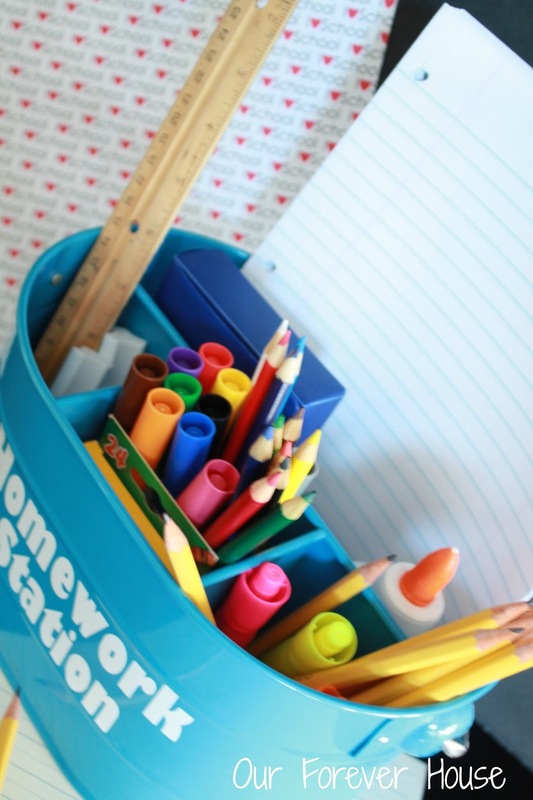 It is designed to hold utensils, plates and napkins but the compartments were perfect for notebooks, paper, pencils, markers, etc. 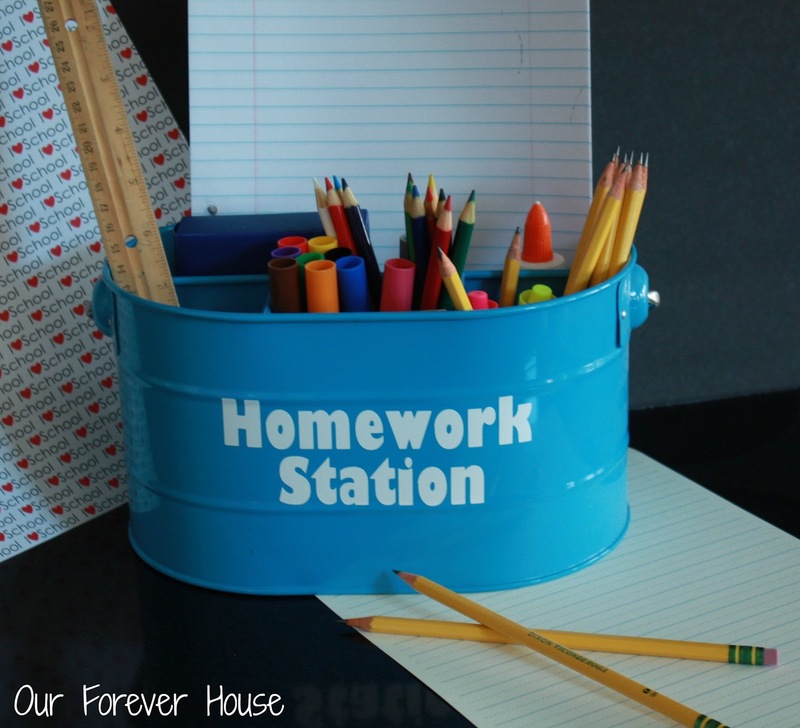 Using my Silhouette, I cut out some vinyl letters to remind the kids that the items in this bucket are to be used for homework. I don't know about you, but everything I own gets "stolen" by the kids and hauled upstairs to their bedrooms, never to be seen again. The kids know that these items may NEVER be removed from the bucket unless being utilized for homework! I will have to let you know how that goes! hee hee! I will not be surprised if I need to add a few things once school starts. As I typed this I thought of scissors. I will need to head to the store this week and pick up a couple of those. Now if I can just get the kids to sit down after school and do their homework without whining! Wish me luck! Aw, this was a very nice post. In concept I want to put in writing like this moreover – taking time and actual effort to make a very good article… but what can I say… I procrastinate alot and certainly not appear to get one thing done.